It's December and definitely time to jump on that holiday shopping if you haven't already! I shared my first gift guide on all things cozy before Thanksgiving. 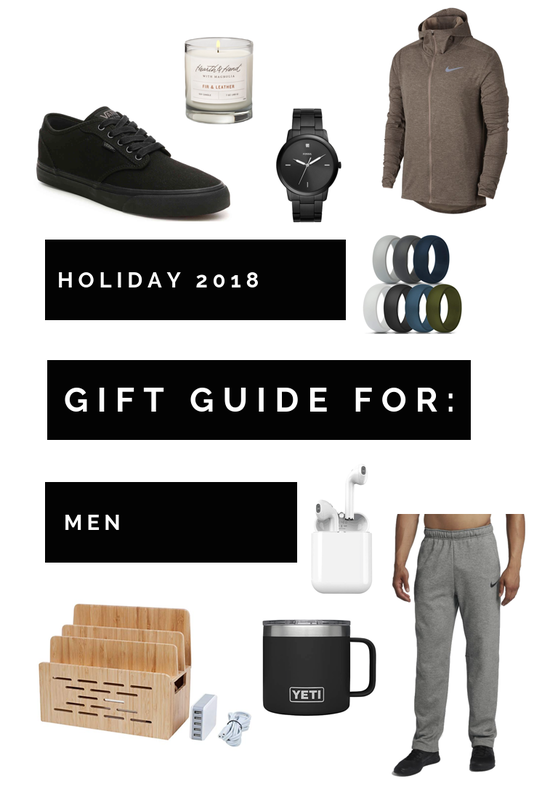 Today I am sharing a gift guide for the men in your life. Chris helped me curate this one, and I think we have pulled some things you will love! Details on each piece below. 1. Vans sneakers - Chris has these and loves them. He has a few pair of Vans but these are by far his favorite. They have built-in Ortholite footbed cushions, and I hear (from Chris) that they are very comfortable. I also like that they are all black... go with almost everything, and are easy to clean! Added bonus - you can get free shipping right now on orders over $35. 2. Candle - Now I know most men won't admit to loving candles, but I know they secretly love candles. I like this one because it is a bit more manly with it's leather scent, and it's from my favorites Chip & Jo. 3. Watch - Chris helped me pick this one out, and we both really liked the sleek all black look. Can be paired with anything, and not always something that guys will go out and buy for themselves. I think this is a great option for your husband, son, boyfriend - anyone really. 4. Casual Jacket - Again, Nike is a go to of mine during the holiday season. Their pull-overs, casual jackets, and pants are all great options for any age group. Last year I got Chris and our Dads something similar, and everyone wears it. The color of this one is nice as well because it doesn't look as casual as some of the other all black ones. Also, if any of your guys hate wearing sweaters and legit jackets (ahem, Chris) then this is for you. Great grab and go option! 5. Silicone Ring - THIS is a must-have in my opinion. They are inexpensive and great for men that work-out, play sports, or do a lot of outdoor activities. I like these because they still look nice, and come in a variety of colors without looking cheesy. 6. Charging Station - Y'all know me and my minimalist attitude. I do not like "stuff" everywhere, and this is the perfect way to stay organized and charge all of your gadgets at the same time. It comes with 5 USB ports, and different slots for your iPAD, phone, etc. You know men are always misplacing things anyway - this may help with that. If not, it will at least help with your sanity! 7. Yeti Mug - We have one of these and I recommend them to everyone. I think they are a great gift option, and not just for men. They hold up to 12oz (bonus! ), keep your coffee warm, and come in a lot of colors! 8. Ear Buds - Wireless buds for your iPhone or Android. Wireless everything is becoming everything, so I guess it's time to get on board. I have been eyeing these for myself, but felt like the guys would really enjoy them. They also come in black, and how cool is the little case they come with? Again, keeping with the organization, and I'm all about it. 9. Nike pants - I pretty much mentioned these above, but I got Chris some of these last year and he requested more this year. That says it all! I don't think a man is every going to complain about sweatpants. Just sayin'. Hopefully this sparked a few ideas for some of the men in your life. My favorites of all are the silicone rings, charging station, and yeti mug. Let me know if you end up snagging any of these, and how the receiver likes them. great ideas - I am thinking the yeti, ear buds, and maybe a silicone ring for my man. thank you!!! You’re welcome!! I think he’ll like those.. such good options!